Of all the rooms in our homes, there are two that seem to have been off limits to modular and collapsible furniture for the longest time: the kitchen and the bathroom. 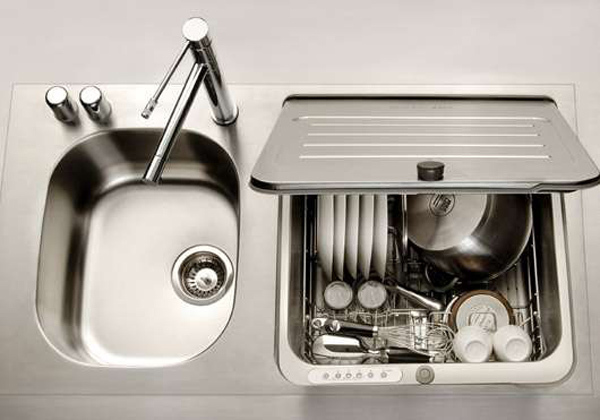 We are very receptive to any concept that grants more surface area, but the idea of a mobile sink or cook top has for ages been synonymous with camping or RV living, and for the most part, buyers have shied away. One pair of designers from Germany’s Burg Giebichenstein University of Art and Design has tried to halt this stigma with their aptly named creation: Justin Case. 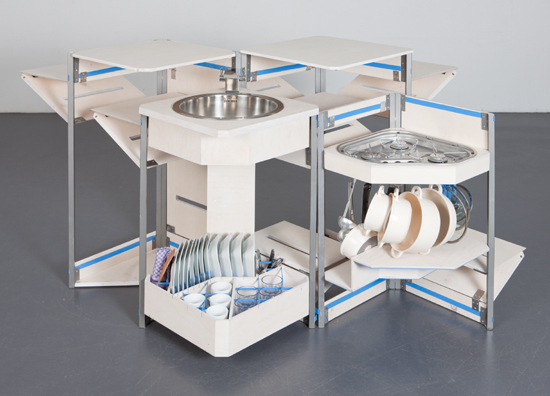 Maria Lobisch and Andreas Näther have designed and constructed an almost perfectly inclusive mobile kitchen and dining surface that guarantees anyone the necessities of living regardless of available space or amenities. 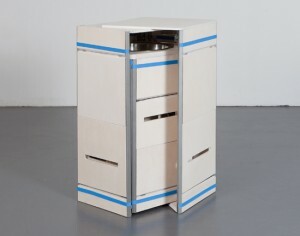 Their concept serves up 100 square feet of kitchen in a collapsible unit you could literally store in a closet. In addition to a sink and small gas hob, there are fold able dining surfaces, room for cutlery, allotted space for dishes and glassware and storage for other small essentials like spices and accents. Self-contained kitchens are now a thing then? Apparently so, and design concepts for this new medium are by no means exclusive to Europe! The team at Atelier OPA out of Tokyo has been working on an entire line of furnishings that can be stored and rolled off stage at a moment’s notice. With more resemblance to steamer trunks than appliances, OPA has brought a feast of alternatives to the table for cramped living. Their kenchikukagu modular series provides virtually every culinary essential, including sink, storage, lighting, and dining surface, all of which are mounted on a rolling system that allows anyone to unplug and glide away when they want to close up their kitchen for the night. 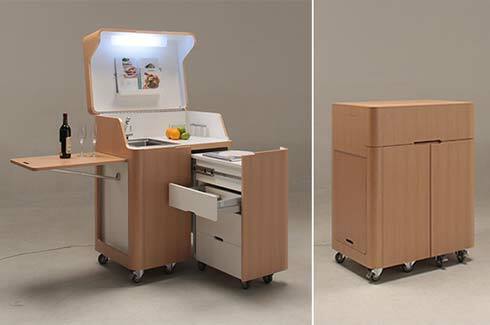 Maneuverable furnishings are definitely the ticket when it comes to mobility and flexible kitchen solutions. More companies are looking at collapsible accessories engineered with rolling casters so that these rescue pieces and transforming helpers can be positioned exactly where you want them, when you want them. 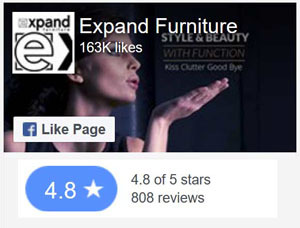 Vancouver’s own ExpandFurniture has favored mobile and convertible furniture right from square-one and such flexibility can be seen in many pieces throughout their portfolio. 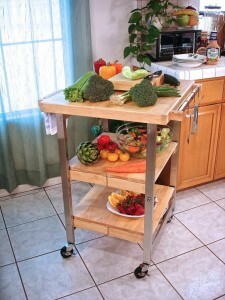 The recent addition of a collapsible rolling kitchen island is no different in its aspirations to offer their customers big possibilities in small spaces. Designed with a modern tone and boasting the very west coast look of stainless steel and parquet hardwood surfaces, the Serenity island accessory gives customers what they want most, space to spare. When expanded, the kitchen buddy boasts a generous 8 and a half square feet of work space which can be opened or tucked away in to time flat. Clever extras such as storage hooks to hang from the unit’s external steel utility bars and an elegant companion wine caddy add a simple touch that makes a big difference on space. Storage hounds will quickly fall for the utility of stemware tracks fixed to the underside of the islands primary surface where wineglasses can be hung conveniently as an elegant final touch. With the offer of so much for so little (space that is) it makes the Serenity kitchen assistants invaluable. 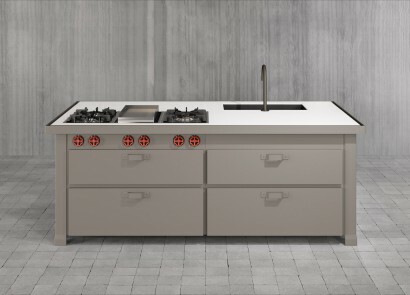 If you happen to be looking for a little more workspace or feel most at home with an Industrial vibe in your kitchen, then Minacciolo, a company out of Treviso Italy, may be well worth a look when considering hardware alternatives for your cooking space. Their “Mina” series standalone kitchen islands offer those with a more generous allotment of room the ideal hardware to get pretty much anything done in the kitchen. If space is more of a concern, their Mini Mina packs its own punch, plating a functional alternative while maintaining the essentials like sink, storage, and grill top. Hard angles, bold colours and dramatic hand cranks on this crafted Italian design are not for the faint of heart, or for those who lean towards a more classical look, but there is no doubt that walking into a room featuring the Mina, you might just take more notice of the tools rather than the cooking. 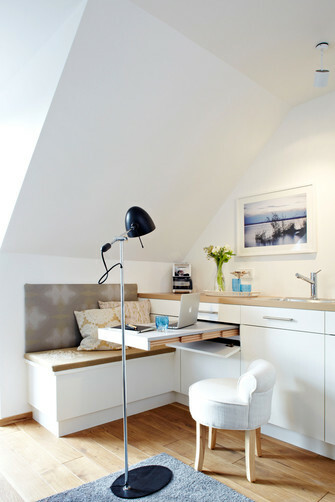 Surface area is probably one of the single greatest concerns when living in a small space. With diminishing condo sizes, entertaining is becoming a tougher chore. Even a buffet style gathering needs a place to lay out an attractive spread, and one of the biggest sacrifices people often have to make when downsizing is to forfeit entertaining as they once did. The option to have a dedicated full sized dining table is not an alternative everyone has available to them. So, when we see companies out there lending their focus on solutions for those who want to accommodate their guests, it is comforting to know there are manufacturers working to bring more space to the kitchen setting. 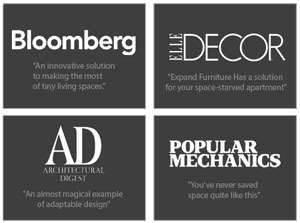 With that in mind, ExpandFurniture has made it their mission to open up confining dimensions with a dramatic selection of table surfaces. Two of these making the biggest impression on customers are the Junior Giant and Box Coffee Tables. The Junior Giant is a hidden behemoth designed to seamlessly collapse into an unassuming console which could be happily placed in a corner, a hallway or nook. Its versatility and potential as an expandable dining surface however is what really sets diners at the edge of their seats. With a range that can accommodate as many as ten guests, the biggest challenge will be cooking for everyone. Also up the company’s sleeve is another useful piece that pulls its weight as a full sized dining unit while compacting down into an unrecognizable coffee top. Fully adjustable and ideal for an intimate living area, the Box Coffee to Dining Table nearly jumps out of its own skin as it raises into place and offers the capacity to host a generous number of dinner guests. Roomy, sleek, and very space friendly, the box coffee has proven itself as a diverse table. Expanding surfaces are a boon for those of us who have them. So why is it few designers are giving the necessary attention to those that utilise kitchen islands and bureaus? Fortunately for us there are companies like Ute Günther out of the southern German city of Konstanz that are looking to add expanding counter tops and work areas to cramped counter top dimensions. Sliding out as easily as a cutlery drawer, and facilitating a handful of uses besides a simple cooking surface the depth of their utility could be fully capitalized in absolutely any kitchen, from the cavernous to the cramped. And, what is it each of us wants most in a Kitchen? If you said anything besides a dishwasher, you have either never gone without, or your drawers are bulging with takeout menus. As someone who loves to cook, a miniscule sink is nearly as unforgivable as a lack of gas elements, but that is an entirely other article in itself! And while I try to dedicate these columns to smaller companies with innovative creations, I can’t help sharing a good idea when one comes across my desk. For that reason I would like to pay mention to Kitchen Aid’s Bravia Dishwasher/Sink two in one companion unit. Cleverly designed to first appear as a sink and wash surface, the company’s design hides a simple bucket style machine that could greatly ease the load of anyone who needs to clean up for more than two diners. The insert has a sharp look, and its efficiency promises a faithful appliance to anyone who may not otherwise have enough lower storage for a full washing system. A balance between taste and necessity will forever be the driving impetus in the design and the promotion of smart kitchen alternatives. Like all double duty furniture, and storage, there promises to be a strong future for bold and innovative additions to our eateries. And while everyone will have their own ideas how to best capitalize on available space, it would seem that our pallets are as just as unique for what’s outside of the fridge as what we keep stocked within. Also Published in New Condo Guide Magazine.